Do you get sick of hearing the same words over and over? Take “fail,” for instance. It was the in word last year, and believe me, I knew it with my kids uttering it at every possible opportunity. I began to feel about the word “fail” the way my father felt about the word “awesome” when I was a teenager: It lost all of its original meaning by misuse and overuse. Thankfully, Lake Superior State University has released a list of Words Banished from the Queen’s English for Misuse, Overuse and General Uselessness for 37 years. And the 2012 List is out! Fellow English speakers, take note. The following words are considered passé by the Powers That Be (or actually the people who nominated them and the professors who compiled the list). Amazing – Guilty, I suppose, since I named this day Amaze-ing Words Wednesday. Do I at least get credit for the word play of “maze” in there with my Threading the Labyrinth blog title? Baby Bump – I had a baby bump for about two seconds, after which it was a basketball embedded in my abdomen. Back when I was carrying, however, maternity clothes were not stretched across tummies like saran wrap, so fewer people noticed the “bump” until it was no longer bumpy but just plain big. Shared Sacrifice – I have noticed that those most likely to encourage shared sacrifice have a lot more stuff than I do. Why is that? Occupy – The best suggestion I heard regarding the Occupy movement was to Occupy Disney World. Now there’s a cause I could go for! Blowback – I’m betting the listmakers will get some blowback for including this word in the Stop-It list. The New Normal – I hear this one all the time. But whatever normal you’re in is new to you – unless you did this life before. Pet Parent – I had never heard this phrase. Maybe because I have a cat. You’re not really a pet parent to a cat so much as an unappreciated roommate. Win the Future – This phrase makes it sound like you scratch off the lotto card and the right numbers get you a future. The future isn’t a tangible thing you can win really. Moreover, is anyone actually suggesting we lose the future? Trickeration – Never heard this one either. Apparently, it’s a fave of sports announcers. Ginormous – Another guilty expression on my face. I have made the ginormous enormous mistake of using this word instead of more appropriate, and recognized by a dictionary, terms. Thank You in Advance – Does saying this absolve a person of later sending a thank you note? Does it presume that the person on the other end will do what you want? Don't you dare use these words. What’s perhaps more interesting is what words appeared on previous lists. Have we gotten better at our use of the following? 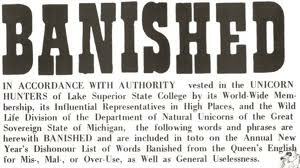 If you want to see the history of the banished words list, be sure to visit the LSSU website. You can find most of the previous lists there as well. What words or phrases are overused or lack meaning? Which ones do you wish we would ban? 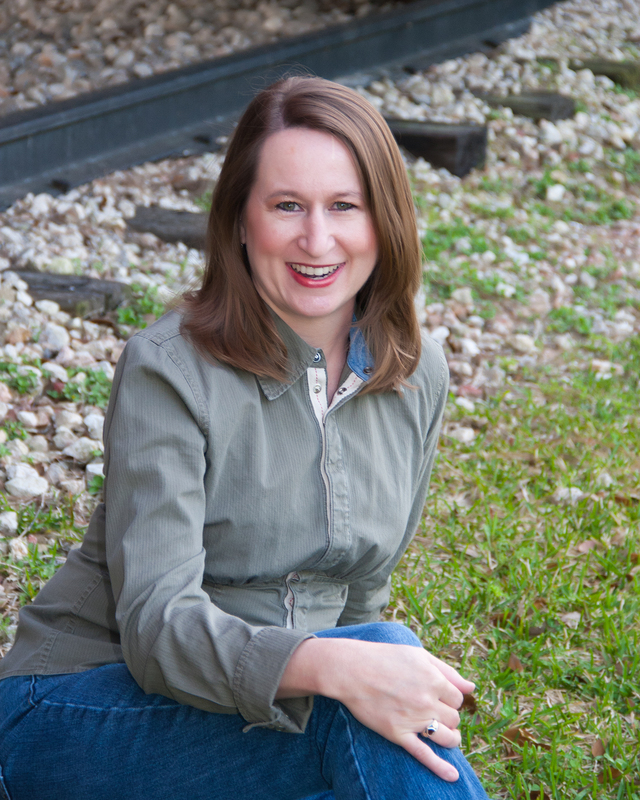 One big shout-out to writer Erin Brambilla who pointed the banished words list out to me! Be sure to check out her website. Her blog is among my favorites. Thanks for the shout out, Julie (wait…was shout out ever banished? Eek!). I saw the article in an online version of my parent’s local paper and I immediately thought of you! I have to laugh at 2006’s banned word–Dawg. I went to Michigan State and we recently played (and WON, woot!) in the Outback Bowl vs. Georgia. A well meaning, but poor spelling, fan made a sign that said “Go Dwags”. The misspelling of the misspelling had me giggling :). Also, now I have to wonder if there is a list of banned punctuation? I’m looking at my response here with an ellipsis, an em dash, some parentheses,and a few exclamation points and am thinking maybe there should be :). I know. Exclamation points are great. They remind me of Schoolhouse Rock’s Interjection song. Amazing is banished?!?! Eeeekee…I use it (and a number of others deemed banished) all the time. I hope the word police don’t come nab me. LOL! Honestly, I say let words live peacefully, long and free. But the list is comical to say the least. LOL!! Oh no, I saw that LOL was banished in a prior year! 😉 I don’t think there are Word Police, Natalie, but if so, I want to go to the academy. Better to be on that side of the language law than the other. Ha-ha! Actually, I think the lists are enlightening to see what our pet words are at any given time. How about “boo-coo” (aka beaucoup)? I know I’ve griped about that one here before, so I won’t get into it. Several years ago, my mother got into the habit of saying “yuppers” instead of yes or yeah. It got so bad I asked her to quit. When I was a kid, gross meant indelicate or vulgar instead of something that came in increments of 100. For example–a gross of firecrackers. This used to drive my dad bananas–especially when my Mamaw started saying it. He kept telling us we were using the word wrong…blah, blah, blah. Love this post. You got me laughing. I love that your family used both the French “beaucoup” and “yuppers.” What a range! LOL. I do think we get our own pet words. My husband has told me to stop saying “Holy crap” already. Oops. Thanks, Catie! Oh, I’m sure this post will resonate (that’s a word I believe should be banished as well) with many readers. I actually hadn’t heard of several of them, like metro-sexual and enemy combatant, but the rest are definitely overused and boring. I wonder what will be next? I love words and you make Wednesday’s fun because of this post. Thanks, Patti. I can feel really out of the loop when a word is so overused that people want to banish it, but it never made it around to my un-cool surroundings. Guess I’m not watching enough reality TV! LOL. Great list! I use amazing and ginormous all the time, lol. Metrosexual is also one of my faves, because it describes a lot of men. And I’m totally sick of man cave. What an amazing post, Julie! All those random and over-used words. I’ve been there and done that. Guess my dysfunctional way of leaving my carbon footprint is a big epic fail. Oh well! See ya later Dawg! Seriously — love the post. I’ve always enjoyed seeing the banned words list. Thanks for listing them and some from the past! Love your way of stringing those banished words all together! Thanks, Rhonda. I liked those blasts from the past too – especially since we still overuse/misuse most of them! My dad banded my sister and I from saying ‘cute’ when we were in elementary school. I’m assuming everything was “cute” to y’all. Funny. When I first read this post, I was so sad to see ‘baby bump’ on the list. I think that’s a much nicer way than saying ‘huge pregnancy belly.’ Not that I would say that either. I always enjoy watching the trends in language. Thanks for the list. You’re welcome. By the way, I think it’s completely okay to submit an original word or phrase in place of a banned one. Maybe baby basket? Infant pouch? Voluptuous tummy? I don’t know. “Huge pregnancy belly” certainly doesn’t sound good either. LOL. GREAT post, Julie! I still think the word “Awesome” is overused too much. I’m guilty of using it too, but I cringe every time I say it. I agree with those, Tiffany. I don’t care who let the dogs out; they just need to go back in. LOL. I think I’m barely in the loop. I still have NO IDEA what “trickeration” is! Thanks, Donna. I never liked “prego” either, Julia! Isn’t that a spaghetti sauce? You’re so right, Jennette! For a while there, everything was extreme. Good catch.